High-purity PTFE products are used in medical, laboratory, scientific, and other applications where cleanliness is essential. They’re made of specialized grades of polytetrafluoroethylene (PTFE), a synthetic fluoropolymer that’s available under a variety of brand names, including Teflon® from DuPont**. Interstate Specialty Products die cuts high-purity PTFE products at its ISO 13485:2016 facility in Sutton, Massachusetts and has additional packaging and assembly capabilities for sensitive components. High-purity PTFE materials are processed in a strictly-controlled cleanroom environment that prevents the introduction of impurities, such as carbon-based contaminants. Production occurs with minimal material handling, and high-quality resins are used for enhanced material properties. Materials are traceable and static dissipative grades are available. High-purity PTFE products are made from virgin materials or specialized compounds. Typically, these compounds are customized or enhanced with fillers. High-purity PTFE products can also be made from materials that are FDA approved or that meet ASTM or NSF standards. Interstate Specialty Products die cuts high-purity PTFE products from molded sheets or continuous rolls of materials. Our cleanroom manufacturing capabilities include precision die cutting and rotary die cutting under controlled temperature and humidity. 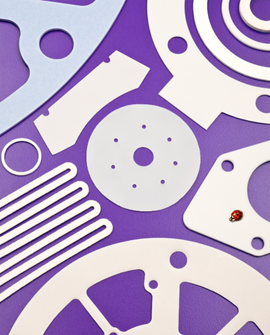 As a verified and certified ISO 13485:2016 facility, we’ve proven that our cleanroom room die cutting services meet strict requirements for medical device manufacturing. In addition to medical, laboratory, and scientific applications, high-purity PTFE products are used in semiconductor manufacturing and with electrical and electronic equipment. With its excellent insulation and dielectric properties, very smooth surfaces, and low friction, high-purity PTFE products are used in insulators and as other equipment components. Interstate Specialty Products is ready to answer your questions about clean room die cutting for high-purity PTFE products. To learn how our application knowledge and technical expertise can support your product designs, contact us on-line or call (800) 984-1811. **Teflon® is a registered trademark of DuPont™.